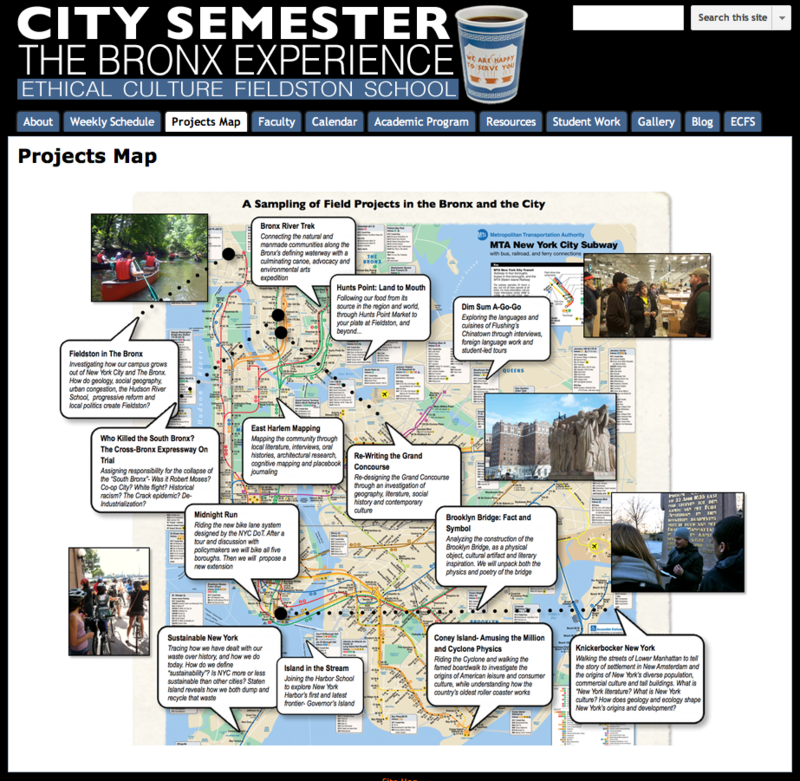 Map of City Semester field projects in New York City. Anderson, however, notes some challenges in the ambitious program, including the expense of having 8-10 teachers devoted to a program serving 15-20 students; scheduling conflicts with other classes; and dealing with the complexity of logistics and weather while off campus (e.g., managing rain or losing the canoe holding the lunches). You can find the students’ perspective on the program’s blog, which seems to have started out enthusiastically and then was slowly abandoned as the semester progressed (no surprise here). Nevertheless, teens are rare visitors to historic sites and museums, so the blog provides helpful content to find out what catches their attention and are memorable experiences. If you are really interested in this new form of education, check out the Independent Schools Experiential Education Network (who knew there was such a thing?). Reviewing their annual institutes, it seems to focus on environmental education, service learning, diversity, and sustainability but hasn’t encountered historic sites or museums (seems this group is strongly affiliated with Project Adventure, a non-profit organization that emphasizes individual responsibility and team-building through challenge courses and adventure camps). This entry was posted in Historical interpretation and tagged Adventure education, City Semester, Ethical Cultural Fieldson School, Experiential learning, Hands-on, Outdoor education on June 5, 2012 by Max van Balgooy.